March 20th is the date of the spring equinox (also known as the Vernal equinox) in the Northern Hemisphere. This event occurs when the sun crosses the celestial equator, and at this time neither the North pole or the South pole is tilted towards the sun. The Latin word equinox translates to “equal night”, and this day marks the beginning of the departure of winter, to make way for the summer. The seasonal change of the spring equinox represents new beginnings, and brings with it longer days with more daylight. The spring equinox is celebrated in different ways in many countries all over the world. The celebration of the spring equinox (or Ostara, as it’s also known) has many customs and traditions in the UK. Druids, pagans, and wiccans usually take a sunrise tour of the famous Stonehenge landmark in Amesbury, Salisbury. Hundreds of people gather together to watch the sunrise in silence. Traditional pagan costume is often worn during the annual ritual that celebrates and honours fertility. The celebration of Easter is held on the first Sunday after a full moon, following the spring equinox. Devout Christians attend a special mass at this time. Many Easter traditions borrow customs from other cultures, and are related to fertility. In the USA, it’s a common practice to decorate boiled eggs and to hide them so that children can hunt for them. For Buddhists in Japan, the seven-day festival of Higan is celebrated at the time of the spring equinox. Literally translated, Higan means “to arrive on the other shore,” The custom involves a time of reflection and contemplation when people consider what awaits them on the “other shore”, once the cycle of birth, death and reincarnation ceases. On the day after the dark moon of the spring equinox, the festival of Nyepi commences in Bali. This festival of religious significance involves the ceremonially transfer of every statue of the gods, from the temples to the river, so that they can be cleansed by the Hindu god Varuna. Villagers perform an exorcism ritual on the day before Nyepi. People dress up and wear masks to represent evil spirits. After singing and dancing, the masks are removed and burned to rid the villages of evil spirits. Nyepi is a major religious festival and silence is enforced by ceremonial street security on this day. It is viewed as a time to exercise control of self. People in Iran, Kosovo, Turkey, and many other Middle Eastern countries celebrate Nowruz (the New Year) on or around March 20th. The people of Asia also celebrate New Year at this time. The word Nowruz means “new day”, and marks the start of a new cycle of rebirth and hope. At this time people clean their homes from top to bottom and repaint and repair, before decorating with flowers. The festival of Maslenitsa is celebrated in Russia to observe the return of light and warmth, and the start of new growth. During the period of Lent, meat and fish and dairy products are strictly prohibited, so the festival of Maslentisa is the last opportunity for people to eat these foods. During the spring equinox the indigenous Mayan people in Mexico celebrate, as the sun sets over the great ceremonial pyramid, El Castillo. 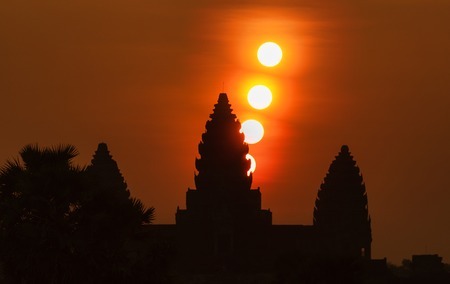 This ancient ritual is known as “The Return of the Sun Serpent”. Known as the Pure Brightness Festival, Qing Ming is celebrated around April 4th-6th in China. The festival honours the changing of the seasons and ancestors. Graves and burial tombs are swept and decorated with gifts of food and flowers. The children help to plant trees before participating in kite flying. To discover what the spring equinox will bring, call one of our experienced psychic readers today.